It is not uncommon for customers to leverage their mobile devices while shopping in-stores. In doing so, they are often comparing prices online, looking for reviews or conducting more research about the item they are considering purchasing. Instead of fearing that these consumers are showrooming (visiting a store to see a product before buying it online at a lower price), brick-and-mortar merchants can now enhance the omni-channel experience of their in-store shoppers by leveraging TouchCommerce’s new TouchStore solution, which enables retailers and enterprises with retail locations to provide online assistance through mobile devices. “TouchStore offers shoppers an instant gratification with personalized online assistance for both sales and care needs,” says George Skaff, CMO of TouchCommerce. For example, merchants can leverage TouchStore to display QR codes or signage that directs in-store shoppers to send a text message to a certain number. By scanning the QR code or sending the text, the shopper will open the TouchCommerce online engagement window on their smartphone. 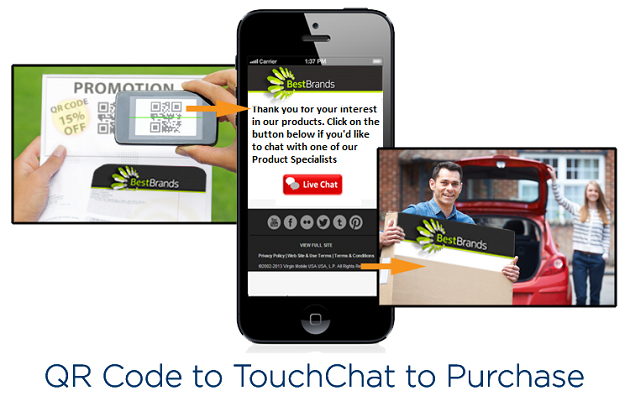 In the background, the TouchCommerce technology and RightTouch platform use product information, prior browsing behavior and a web-based customer interface to target the shopper with specific content or automatically route them to a live chat expert. Plus, the shoppers’ prior browsing behavior is also sent to the agent at the start of the chat session. In addition to answering questions, the chat agent can provide content to the shopper like videos, coupons, guides and surveys. The TouchStore technology offers benefits to shoppers and retailers alike. Shoppers, for instance, are able to obtain personalized support and use their mobile device to self-serve themselves throughout the decision making process. On the other hand, retailers can increase conversions and customer satisfaction, while also reducing support costs. Plus, TouchStore allows retailers to sell products that may be out of stock in-stores but available online, as the chat representative can provide shoppers with this type of insight and direct them to the right product page.